Pre-orders for this style are arriving late May. Expected release date is 30th May (tbc). Any changes will be updated here. Pre-Orders for this style are arriving late May. Expected release date is 30th May (tbc). PLEASE NOTE: Pre-orders are currently open on our website for two shipments. This product is due on the second shipment arriving late May. It is finally here! 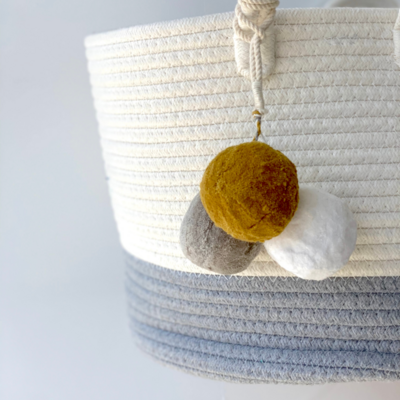 Our eagerly anticipated ROUND design is perfect for nurseries and play rooms. 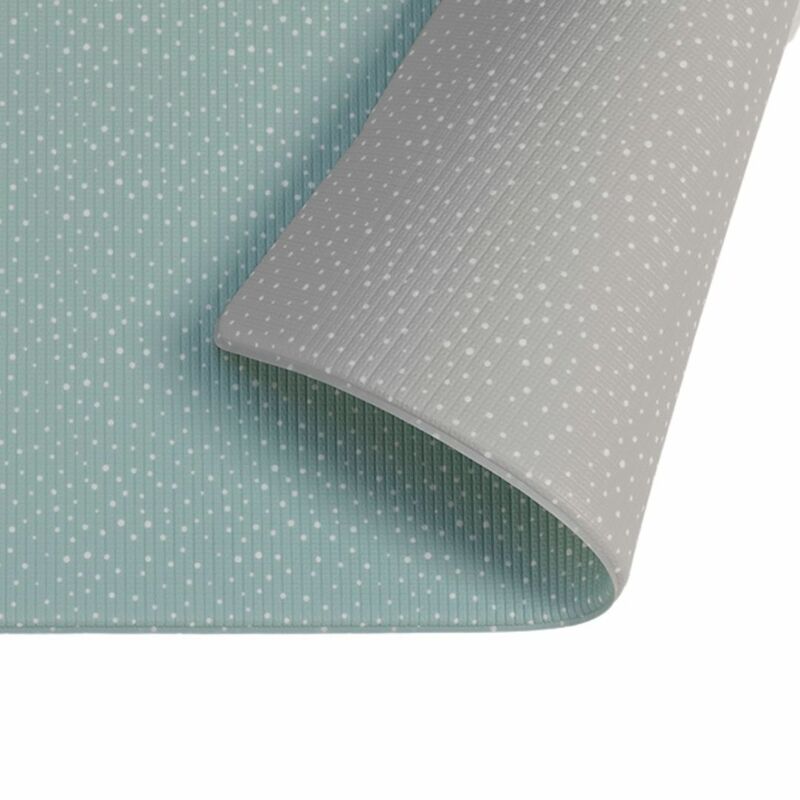 A beautiful seafoam colour on one side, speckled with fine dots, then flip it over for a soothing soft grey in the same pattern. Give your baby the most stylish and safe place to play, with our latest gender neutral creation, in our popular padded style. 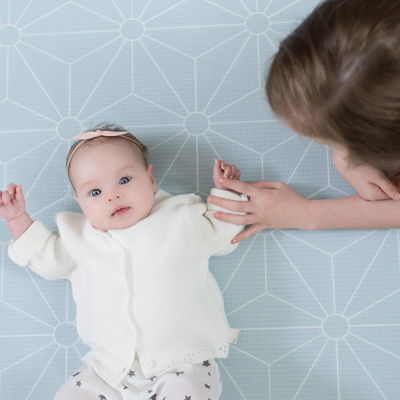 Our Luxe Play Mats are super soft, stylish, non-toxic, durable, waterproof and suitable for the whole family. A play mat you'll actually be proud to have on display. 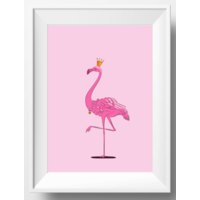 Stylish, subtle, gender neutral designs, for house proud families. For comparison, our NEW round range is smaller than our Large rectagular designs that are 2m x 1.4m, but larger than our Medium 1.4m x 1m designs. Our mats have been created in conjunction with an Interior Designer, inspired by the latest trends. You will be proud to leave it on display in your home (even when the kids are in bed)! One-piece design (no annoying puzzle pieces that pull apart)! Double-sided. Features the same design front and back. Paired-back, simple, classic designs to compliment your décor, not overshadow it (NO bright primary colours or overstimulating childish designs)! Looks gorgeous as the background for your baby milestone insta pics (just saying)! We have upgraded our manufacturing materials so that our Luxe Padded Play Mats are tough enough for the whole family. Material: non-toxic TPU (polyurethane), with a shock-absorbent, 1.5cm thick foam core and a durable, wipe clean topcoat. The use of TPU (polyurethane) compared to PVC (poly-vinyl chloride) creates a safer play mat for your children, without the harmful and toxic chemicals, however still allows for a durable and hard-wearing mat which can be easily wiped clean. Do not contain harmful heavy metals (such as lead or mercury) or toxic substances (such as formamide & formaldehyde, phthalates, BPA or endocrine disruptors). For more information, our full testing report can be found on our website. Remove packaging and discard away from children. Re-roll your play mat in the reverse direction, then lay it flat to allow the play mat to relax. Wipe clean with soft cloth or damp towel. Avoid sharp, rough & hot materials from coming in contact with play mat (such as shoes, vacuums, and hot coffee cups). Not suitable for animals or pets. They may cause damage. Wipe clean with a damp cloth or clean with a gentle detergent. Avoid using baby wipes to clean with. Some brands may cause damage to the mat's surface over time. Heavy furniture placed on the play mat may cause depressions that could become permanent. Makes floor play more comfortable for all aged children (and adults – yoga anyone?). Protects little ones from bumps and bruises on hard floors. Provides insulation from cold floors. If the product is found to be defective, your Luxe Padded Play Mat is covered by a 6 month warranty from the date of purchase, with a valid reciept.